In 1880, Queen Victoria sent President Rutherford B. Hayes a desk made from the wood of H.M.S. Resolute, an Arctic exploration ship. At the request of President Franklin D. Roosevelt, a panel was put on the front of the desk to hide his leg braces. 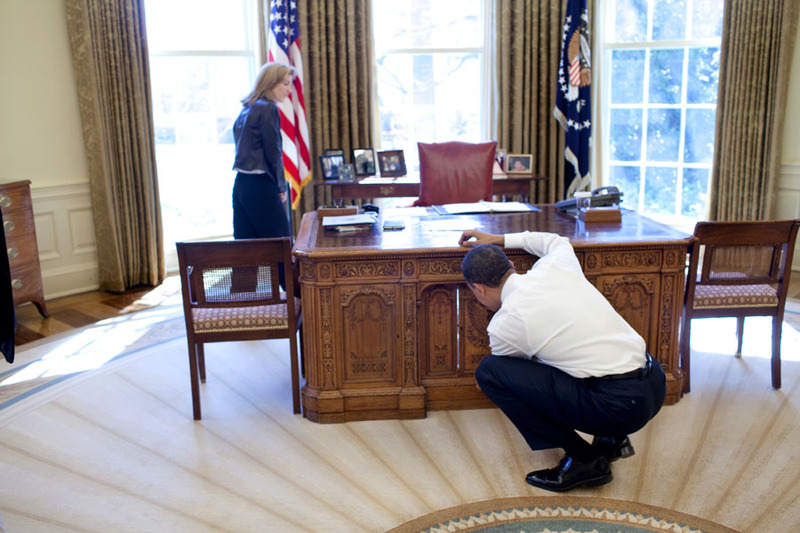 President John F. Kennedy used the Resolute desk in the Oval Office. And in October 1963 the desk featured prominently in a series of photographs Stanley Tretick took of President Kennedy and his young son. Several of these photos appear in Capturing Camelot: Stanley Tretick’s Iconic Images of The Kennedys, including the most famous, a shot of John Jr. looking out from the front as his father sits behind the desk.